We are often asked about what glue is suitable for the soft plastic figures we feature on our site, and as a result we have created this page. Ever since Airfix first produced their figures the issue of glue has been a problem. Like all plastic kit manufacturers Airfix made their own brand glue, which was polystyrene cement. This worked well for the hard plastic that kits are made out of as it melts the surface and makes a good bond, but on the soft plastic figures it could not penetrate the surface and the bond was very weak. On the box Airfix suggested using Bostik. That worked no better than the polystyrene cement but after a few minutes of breathing the fumes you didn't care any more. Since some Airfix figure sets, particularly the cavalry, really require gluing this was a big drawback to their product. Around the late 1990s there started to appear other compounds of plastic which had the same sort of properties as the traditional plastic but which could be securely glued using ordinary polystyrene cement. HaT were the first figure manufacturer to experiment with this, and currently use a very soft version which does indeed glue well. Other companies like Emhar and IMEX now use a much harder material, which is better for good detail but more prone to thin parts breaking. Nonetheless they too make an excellent bond with ordinary polystyrene cement. Around 2005 Italeri started making their sets with yet another type of plastic. This is a little softer than the Emhar/IMEX formula, but that too can be glued very successfully. It is to be hoped that in the future other manufacturers will adopt a similar policy for their figures. The new plastics are all very well, but that still leaves us with all those old sets that defy assembling. Luckily, at the start of the century a version of Super Glue appeared that was specially designed for plastics. Like all super glues it required a 2 stage process - first the surface is prepared, then the glue is applied. However this produced a very firm bond on every plastic we tried - even the old Airfix kind. Indeed we found the bond was stronger than the plastic itself. This answer to all our dreams is cyanoacrylate, but it may be marketed in different countries by different companies under different brand names. All we can do is say how it is sold here in the United Kingdom. 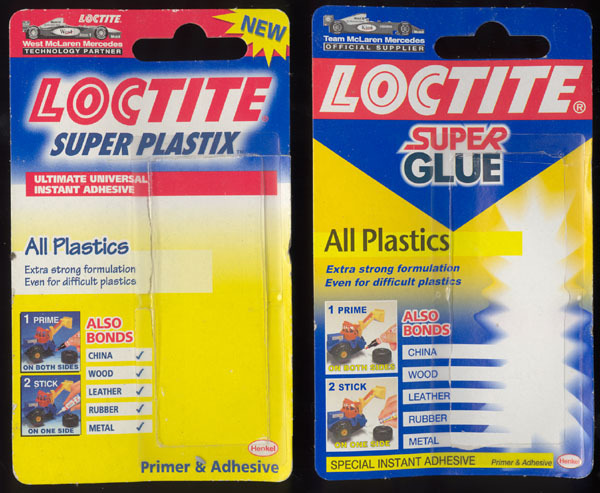 It originally appeared under the name 'Loctite Super Plastix' (blister card 1 below), but more recently it has been changed to 'Loctite Super Glue - All Plastics' (blister card 2 below). This glue is not so easy to use, nor is it as cheap as polystyrene cement, but it is well worth the effort as the results are excellent. See your local dealer for information on how this type of glue is marketed in your region.